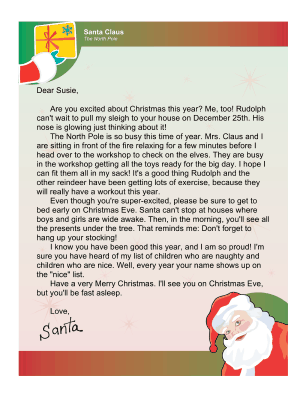 This printable letter from Santa captures the excitement and energy children feel as the Christmas holiday approaches. In it, Santa references his busy workshop and reindeer and urges the child to get to bed early on Christmas Eve. Are you excited about Christmas this year? Me, too! Rudolph can't wait to pull my sleigh to your house on December 25th. His nose is glowing just thinking about it! The North Pole is so busy this time of year. Mrs. Claus and I are sitting in front of the fire relaxing for a few minutes before I head over to the workshop to check on the elves. They are busy in the workshop getting all the toys ready for the big day. I hope I can fit them all in my sack! It's a good thing Rudolph and the other reindeer have been getting lots of exercise, because they will really have a workout this year. Even though you're super-excited, please be sure to get to bed early on Christmas Eve. Santa can't stop at houses where boys and girls are wide awake. Then, in the morning, you'll see all the presents under the tree. That reminds me: Don't forget to hang up your stocking! I know you have been good this year, and I am so proud! I'm sure you have heard of my list of children who are naughty and children who are nice. Well, every year your name shows up on the "nice" list. Have a very Merry Christmas. I'll see you on Christmas Eve, but you'll be fast asleep.